The Nintendo 3DS is a handheld console created by Nintendo in 2011. 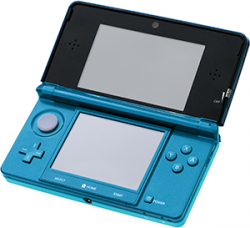 As the successor to the Nintendo DS, the console features two screens, with the bottom having touch controls. The console boasts a better set of specifications to its predecessor, but also allows for 3D vision without glasses on the top screen. Various capture cards that allow lossless video and screenshot taking, with the assistance of a PC. Citra is an open source emulator taking cues from Dolphin in terms of presentation and support. It runs many 3DS games and can even play games that support local wifi but the emulator is still WIP with many known games not working yet. It requires a very powerful computer that has a 64 bit processor to run with some games requiring higher requirements than others.